One presumes that Colbert Nation does not approve of this one bit. Its leader sailing off into the Bermuda Triangle? And leaving his people behind? How could he? 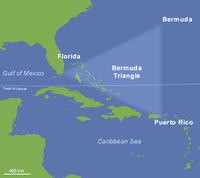 Stephen Colbert, it’s the Bermuda Triangle! Where boats and airplanes mysteriously disappear. Where yachts with comedians vanish without a trace. Think USS Grampus. Gone. Think SS Cotopaxi. Vanished. Think Flight 19. Disappeared. Think again, Stephen. Come May, despite any protestations, the comedian from Comedy Central will set sail in the Charleston Bermuda Race 2011, racing 777 miles from his native hometown of Charleston, S.C., to Bermuda, otherwise known as the tip of the Bermuda Triangle. He’s never coming back, Nation. Prepare for the worst. After all, the last time Colbert participated in this race, in 2005, he and his friends encountered paranormal activities. At least one would suspect they did. Oh sure, he managed to avoid any vanishing-without-a-trace funny business and returned to eventually launch Comedy Central’s “The Colbert Report” later that year. But he was missing for two days. Well, OK, not really missing, but his racing team ran out of fuel and didn’t reach Bermuda until two days after the awards ceremony. Worse, the yacht lost its sanitation system. 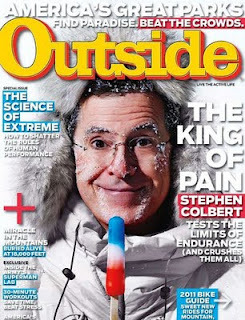 “Boat toilets...are floating Porta-Potties,” Colbert told Outside magazine in its May issue hitting newsstands Tuesday. “Ours, through an understandable oversight, had not been emptied since the Carter administration. He didn’t. But it was close. Why did Stephen Colbert go sailing in the first place? An appetite for racing, perhaps? Actually, it doesn’t sound as if he was cut out for being on the water or in a yacht at all. Nevertheless, Colbert forged ahead and participated in the biennial race, featuring monohull and multihull sailboats. This time, Colbert has another incentive. In February on “The Colbert Report,” the Comedy Central star challenged British entrepreneur and adventurer Richard Branson to compete against him in the race. It will decide who is “the greatest sailor in the world,” Colbert announced. Considering Colbert’s running feud with Branson, it’s doubtful he’ll accept. Or, maybe Branson knows better, knowing the perils that await a racing team sailing off course and deep into the Bermuda Triangle. Hmmm. We presume Colbert Nation has only one message for its fearless leader: Don’t go, Stephen. What Stephen Colbert needs -- SpyBubble: A Cell-phone tracking device! Life is too short, I say let Stephen Colbert sail! He has a whole racing team with him to keep him safe anyway. Let him experience this once in a lifetime adventure. Too bad it didn't push through. The area is known for notorious disappearances.